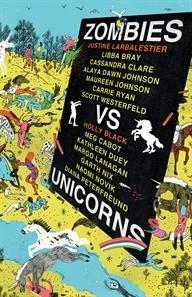 It’s a question as old as time itself: which reigns supreme, the zombie or the unicorn? ‘For too long, the zombie has dominated the public consciousness, but the reign of the unicorn is at hand!’ Holly Black - Team Unicorn ‘I think that posterity will look upon this as the moment when zombies took their rightful place at the top of the food chain.’ Justine Larbalestier - Team Zombie Contributors to this unique collection include bestselling teen and YA authors, Garth Nix, Meg Cabot, Scott Westerfeld, Cassandra Clare, Libba Bray, Maureen Johnson and Margo Lanagan. Zombies vs Unicorns challenges you to pick a team, and stick to it. But be warned, these are stellar story-tellers, and they can be very convincing.